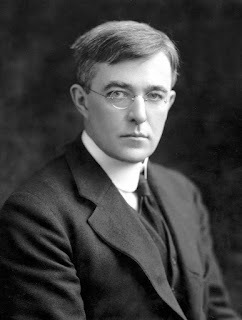 It's American chemist Irving Langmuir's birthday today, so it's a good time to remind ourselves of his very illuminating and timeless warning about "pathological science". Langmuir was the first industrial scientist to win the Nobel Prize. The prize was awarded to him for pioneering contributions to surface chemistry, although he also did important research in electronics and solution chemistry. He did most of his work during the early part of the 20th century when science - especially physics and chemistry - was advancing at breakneck speed. Not surprisingly, when science advances at breakneck speed, so do its quacks. Langmuir took note of the many cases of fraudulent science published during the previous decades and in 1953 gave a talk about the misuses of science which he titled "pathological science". His basic definition of pathological science was "science" which tricked people into believing false results by "subjective effects, wishful thinking and threshold interactions." Not all pathological science is willfully fraudulent, but all of it suffers from a common set of pitfalls that distinguish it from solid science. One can recognize how prescient Langmuir's talk was by the fact that many of the criteria we use today for evaluating scientific results or progress and identifying scientific misconduct are elaborations of his theses. Among the cases of pathological science that Langmuir cited were N-rays, Martian canals, UFOs and extrasensory phenomena. The list has only grown since then, and to it we can today add homeopathy, polywater, cold fusion, "arsenic bacteria", faster-than-light neutrinos and evidence of cosmic inflation. There are many causes of pathological science. Some of them are simply the result of working at the frontier of science where little is known and mistakes are easy to make, others are the result of cognitive, social and emotional biases which scientists suffer from as much as anyone else, and yet others can be the result of active fabrication. Homeopathy is a classic manifestation of this particular feature of pathological science. It rests on the potent medical effects of barely detectable (and in many cases non-existent) substances dissolved in water. However, the example of "arsenic" bacteria looks at this feature from a different vantage point. In that case what the authors (who claimed that they had discovered bacteria growing on arsenic instead of phosphorus) failed to test for was traces of phosphorus that could have actually invalidated their hypothesis. Sometimes a causative agent of "barely detectable intensity" could in fact be valid, but even in that case its effects need to be consistent and reproducible, and there also needs to be a good theory which can support its causal connection to the phenomenon under investigation; that connection can validate the dependence of the effect on the intensity of the cause. The arsenic bacteria case failed on both counts. The effect is of a magnitude that remains close to the limit of detectability; or, many measurements are necessary because of the very low statistical significance of the results. This is a straightforward caveat against statistical insignificance. When Langmuir was lecturing the science of statistics was just coming into its own. Since then and especially in the last decade or so, mountains of material have been published on key statistical concepts and pitfalls like p-hacking, effect size, sampling bias and cherry-picking. Pioneering psychologists like Daniel Kahneman and Amos Tversky have showed how humans can be fundamentally incapable of thinking statistically. Failure to pay attention to any one of the myriad important statistical measures can deceive scientists into seeing a result where none exists. In my own field of molecular modeling, due attention to statistics has become a rallying cry for many scientists. The reproducibility crisis has turned into one of the biggest challenges to contemporary science. That being said, one has to appreciate that scientists in some areas like particle physics are working at the very edges of statistical meaning; particles like the Higgs boson are discovered by looking at three or four sigma levels of statistical significance. In that case Langmuir's second caveat is important; you have to make many more measurements than what would be ordinarily necessary - or feasible for that matter - to confirm the effect. That is why data at the LHC comes from billions or even trillions of collisions between particles. The same goes for testing subtle effects of drugs across diverse populations. Solid science never tries to make claims that are bigger than what its edifice would sustain. I would think that most pathological science actually tries to keep away from proclamations of great accuracy, instead trying to skirt falsification by keeping its claims as vague and generic as possible. Astrology is a notorious example, keeping its "predictions" so vague that almost any event will "confirm" them. And yet I can also imagine practitioners of pathological science trying to dazzle credulous believers with the false veneer of accuracy. In this category I would probably place any number of health fads that allow you to lose 20 pounds in exactly 13 days, or guarantee immunity against a remarkably accurate and comprehensive list of maladies. So Langmuir is right in this regard; if it sounds too accurate, it probably is. Fantastic theories contrary to experience. This particular caveat was Langmuir's way of saying that "extraordinary claims require extraordinary evidence", about twenty five years before Carl Sagan said it. Any number of pseudoscientific phenomena will fall into this category: alien abduction, psychokinesis, the afterlife, reincarnation...the list goes on. More challenging claims are those like the ones about "arsenic" bacteria. These are at least plausible enough in principle and don't seem to violate any known laws of physics and chemistry, but given the number of conditions that need to be simultaneously satisfied in order for them to be true, they are extremely unlikely except in the face of convincing evidence. At this point it's worth pointing out that there have been a number of theories in science, most notably in physics, that are in fact quite fantastic. Time dilation, spacetime curvature and quantum entanglement are only three of them. Yet what made these amazing creations of the mind plausible was the mathematical rigor behind them and their agreement with previous theories (relativity for instance arose from a desire to make Newton's laws of motion and Maxwell's laws of electromagnetism consistent with each other). And even then, they were regarded as hypotheses before experiment overwhelmingly confirmed them; that is why even today, in spite of the fact that they run completely "contrary to experience", we still believe these theories. I can think of no better example of this feature of pathological science than creationism and intelligent design. Come up with an objection to a creationist idea and the creationist will have an answer for it. In almost every case the answer will be non-falsifiable and so general that it will either be impossible to disprove it or it would be possible to always "prove" it because of its hollow generality. At some point your theory then becomes so wide as to accommodate every single objection and fact, and a theory that explains everything then ends up explaining nothing. Ratio of supporters to critics rises up to somewhere near 50% and then falls gradually to oblivion. This is an especially amusing and true aspect of pathological science. Usually when an improbable discovery is announced there's always enough number of believers to push hard for its plausibility and significance. Part of the reason is psychological; we actually want new, groundbreaking discoveries in science. The discovery of cosmic inflation and that of arsenic bacteria both fall in this category. I don't know how many of those who read about these believed in them, but Langmuir's estimate sounds rather reasonable. It did not take much longer then for this number to rapidly dwindle and fall to oblivion. The political environment in the near future is almost certainly going to push its own brand of "science" on the public, even as it revels in its own version of "facts". In addition, the deluge of big data has already made it hard to separate the wheat from the chaff. All this has lowered the bar for deception and outright fraud. Only scientists can police each other and make sure that chicanery, both willful and accidental, don't become part of established scientific fact. Irving Langmuir's warning about pathological science shines as brightly as ever. Don't know why cosmic inflation is in this list, isn't it a very established theory? Yes it is. However experimental evidence is lacking, and I was referring to the BICEP story which turned out to be a dead end because the signal was actually coming from dusk. Inflation is certainly not in the same category as astrology, and pathological science covers a wide range of phenomena. No, Cosmic inflation is not verifiable with true "empirical evidence". We have not been observing our cosmic neighborhood long enough to actually say we have witnessed cosmic inflation as it is widely accepted. The inflation we have witnessed could just as easily be a "burp" in the cosmos. Dark matter had to be invented to account for inflation, that makes it absolutely pathological science. The great irony is that Langmuir devoted a great deal of time and effort championing the idea of cloud seeding, despite the lack of solid statistical evidence as to its efficacy.